From an 1859 book: "In North Holland and West Friesland, also, sizes are found in which one hundred and fifty to two hundred quarts of cream can be churned. The churns have each a strong cover at the top, which fits into their rim about the thickness of the hand, with a hole in the middle for the dasher. The churning is performed either by the hand motion of the dasher, as in all small dairies, and in the smallest churns, or by man-power with the help of certain mechanical contrivances. The means for effecting this are different, and so the churns have different names. In many dairies, for instance, they have a lever connected with the dasher; in other places they use a flexible pole, fixed into the ceiling above, for facilitating the motion of the dasher, or put a lever in motion with the feet, which raises and sinks the dasher. There are also complicated artificial butter-machines and butter-mills, which are named after the inventor, the manufacturer, or the motive power. The most known and widely used are the turning-mills, the wheel-mills, and the clock-work mills; as the Hand Butter-Mill of Valk, Fiirst's churn, etc. 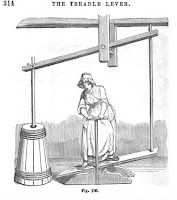 The Lever Churn is very commonly used in South Holland, Fig. 101. 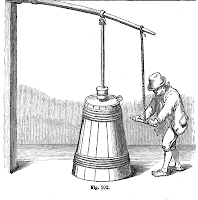 The churn itself is barrel-form, as already described, and the dasher is put in motion by a lever. The upper end is pierced with holes, through which runs an iron pin. In a beam of the ceiling two joists are firmly fixed, about a foot and five inches long and four inches square, and several inches apart. The longer arm of the lever is four feet and seven inches; the shorter, three feet and six inches. 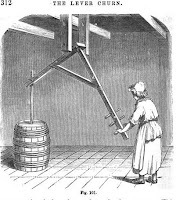 The churn stands under the short arm of the lever, where the dasher is fixed. By drawing the longer arm of the lever towards him, the operator presses the dasher down through the cream. This mode is far less wearisome than the hand-churn, because by the lever, with less expense of power, a far greater agitation is produced. A weight is sometimes attached to the longer arm, by which the power required is still further reduced. Churning With an Elastic Rod. The old-fashioned churn is set in motion by the aid of another kind of power, as seen in Fig. 102. A long, tough, flexible stick is fastened into the cross-beam in the ceiling, so that its larger end is held firm by two iron clasps. The elasticity of the rod is such that, when the smaller end is drawn down by hand, which, at the same time, moves the dasher, it rebounds, and thus saves considerable expenditure of power. Churning with the Treadle Lever. in motion by the feet, as in Fig. 103, where several levers are united to produce the upward and downward motion of the dasher. 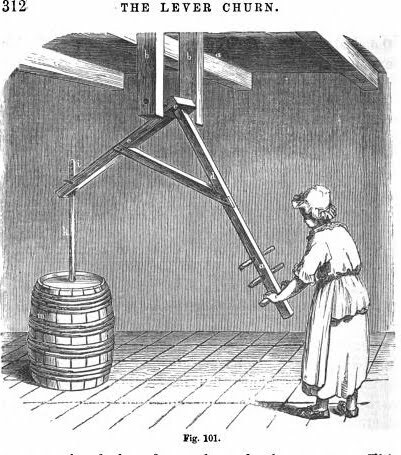 The longer arm of the lever is connected with the churn, and the shorter is set in motion by a foot-board. 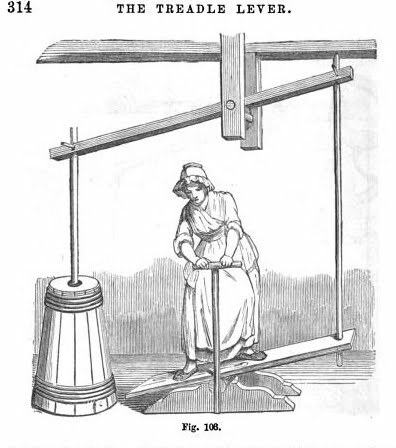 The foot-board lies on a roller, with its longer part attached to the lever; and by throwing the weight of the body upon this part the shorter arm of the lever is drawn down, and the longer, attached to the churn dasher, is raised. The mode of operation is so plainly seen in the cut as to need no explanation."